The ciliary processes (processus ciliares) are numerous and irregular and can fuse with one another. In the equatorial region, they attach directly to the lens capsule. The posterior part of the ciliary body is attached to the lens by zonular fibers. 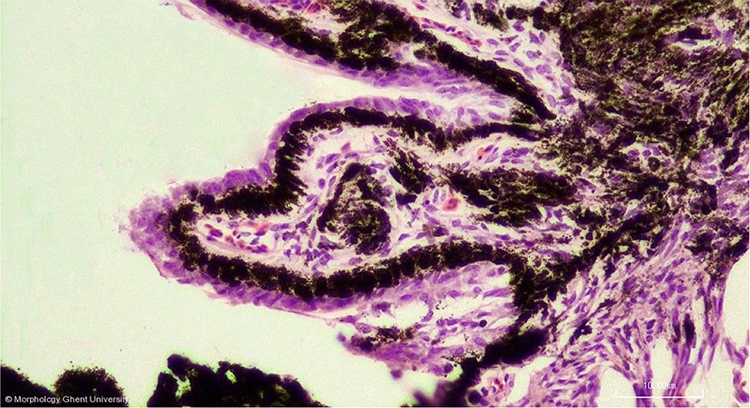 The ciliary processes are covered by a double-layered non-light sensitive epithelium (pars ciliaris retinae). The outer layer is pigmented and cuboidal and is continuous with the pigmented epithelium of the pars optica of the retina. The inner layer is unpigmented and cuboidal to columnar.